CAN I JOIN 100 WOMEN WHO CARE UXBRIDGE WITH A GROUP? You sure can! We understand that in these difficult financial times it may be hard to participate in charitable giving on your own; however, joining with a team allows you to split the cost and time commitment amongst teammates and creating community with coworkers, friends or like-minded peers. To sign-up as a team, each member must complete a Membership Commitment Form on which she will indicate how the $100 donation will be distributed between each member of the team. There is a maximum of 4 people allowed on one team. A member who has signed the Membership Commitment Form can submit the name of a local organization. At random, three organizations will be selected at the meeting. The nominating members will be asked to come up and give a short, five minute presentation as to why the organization they are nominating should receive the donation and then spend about two minutes for Q&A. Any member can submit a charitable organization for consideration; however, she must submit a Charity Nomination Form to the Executive at least two weeks prior to the scheduled meeting. The member who nominates the organization can present or they can opt to nominate another member to speak on their behalf. Teams may only nominate one charity per meeting and one representative should be elected by each team to speak on all team members' behalves should this charity be selected for presentation. Guests are not permitted to present. If we draw a charity and the nominating member is not in attendance, we will allow a secondary member to speak on their behalf (please notify the Executive of this in advance). If the member does not nominate a secondary member to speak on their behalf, the Executive will extend an offer to another member to speak on behalf of the charity that has been drawn. If no volunteers, another charity will be drawn. At this time, in order to be considered at a meeting, an organization must be based in and/or serve Uxbridge or have some type of local connection. It also must be a registered, not-for-profit or charitable organization able to provide tax receipts for donations. We are not considering nominations to national or international charities, programs, or organizations at this time, as the current focus is on contributing to our local community. A charity can be nominated at each meeting as long is has not been a recipient of the group's donation in the past year. The exception is a specific program within a large organization (for example, a specific department or program within a hospital), which may be considered again after one year for a different program or department. We will accept multiple charity nominations for the same charity. All approved and legitimate charity nominations will be eligible for the draw box on the night of the meeting; however, a charity will only be able to be drawn and brought to a vote with the membership once per meeting. Absolutely! Only registered, not-for-profit and charitable organizations will be sponsored by the group. Checks are written directly to selected charitable organizations and not to 100 Women Who Care Uxbridge at each meeting. If they cannot be sent electronically, tax receipts will be issued directly by the charitable organization to 100 Women Who Care Uxbridge. She can send in a blank, signed cheque with a trusted friend or another member to the meeting (preferred). The surrogate member will then write in the name of the charity that is chosen on the cheque and give it to the Founders on her behalf. A friend acting as a surrogate member may not vote on behalf of the absent member unless a Proxy Ballot is completed (see below). She can contact the Executive at info@100womenuxbridge.com and arrange to deliver her signed cheque. We have introduced the "Proxy Ballot" for those who are unable to attend a meeting. You can give another member authority to vote on your behalf as long as they present the proxy Ballot form AND a cheque for $100 on your behalf. Click here to download the proxy Ballot. Because the goal of 100 Women Who Care Uxbridge is to make a large donation on behalf of the whole group, the answer is no. We want to be able to support this endeavor and give at least $10,000 at one time to make a large impact in our community - with each member's donation being part of the larger donation. This is the power of individuals united for a cause! We also need to be able to track your donations so that you get credit for the donation and remain an active, voting-eligible member of the group. HOW MUCH OF MY DONATION GOES TO ADMINISTRATIVE COSTS OF 100 WOMEN WHO CARE UXBRIDGE? None of it! 100 Women Who Care Uxbridge is organized and operated by a volunteer super team of four ladies. Everything else has been given to us by generous donors in our community. 100% of the money raised at our meetings goes directly to the selected organization! 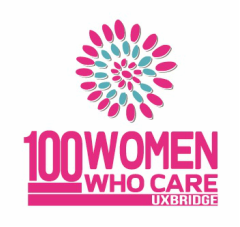 100 Women Who Care Uxbridge collects members' information (including name, address, and email address) strictly for the purpose of maintaining our membership list and assisting charitable organizations when creating individual tax receipts. 100 Women Who Care Uxbridge will not sell, give, or otherwise share your personal information without your express consent, unless required by law.